Seems you couldn’t really be considered a legit reporter or editor this week if you weren’t writing about Jimmie Johnson’s rare slump. The thing is, the kind of “slump” that Johnson is going through in Sprint Cup right now is not rare. Not even close, and not even during his championship seasons. 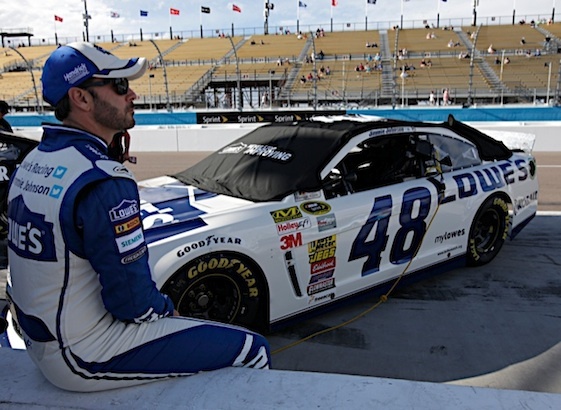 Johnson will start the race at Michigan International Speedway on Sunday having gone five races without a top-10 finish. In three of those races, he’s finished outside the top-30. Hence, one supposes, the talk of slump and, even more oddly, talk that Johnson will have to wait at least another year to get that historic seventh Cup championship. But looking backward, it becomes apparently that in most of his championship seasons, Johnson went through “slumps” and periods of “bad luck” before not-so-mysteriously pulling things together at the time that it mattered most. Take 2006, for example. The year Johnson won the first of his six championships. From Race 22 to Race 31, he had exactly one top-10 finish. In the final six races of the Chase, he posted podium finishes five times. The next year, same deal. From Rac 13 to Race 20, he had just two top-10s while at the same time, he had six finishes of 15th or worse. He went on to win four Chase races and stand on the podium six times. And so it has gone for Johnson. In every one of his championship seasons, he had gone through “slumps”. And usually at about this time of the season. And not all during his five-straight-championship run. Last year, he won the championship despite going with just one top-10 from Race 21 to Race 26. In three of those six races, he was 36th or worse. On Friday at MIS, Johnson was asked about his current slump and about having a run of bad luck. Six-time didn’t seem to be too bothered by anything. Michigan, despite his victory at the 2-mile oval earlier this year, has not been a Johnson track. His average finish at the place is 16th. But Johnson knows racing, he knows history, he knows his equipment and he knows his Hendrick Motorsports team. He knows he’s won six championships despite periods of bad luck and lousy finishes. Hence his continuing to be unfazed by a mid-season “slump”. Winning championship No. 7 is in no way assured. But neither is it any less likely today than it was five races ago.